winds are east at 5-8 knots with 1.5 meter swell. Partly cloudy skies. We are departing in one hour (Tuesday morning local time, which is 0000 utc) from Scarborough Marina, heading for the island of Anatom in southeast Vanuatu. The course will be far from a straightline. We will start off heading northeast but then turn due east after a day or two when the wind switches and go about 400 miles or so that way until we turn northeast again. It we get tired, or the forecast changes, we will divert to Noumea in New Caledonia. The trip to Anatom will take 7 or 8 days, a day less to get to Noumea. The weather forecast looks good. The winds will start off as moderate SE with a largeiish swell leftover from the past weeks storms. We will zigzag with the wind shifts. We are excited at beginning another season of adventure in the South Pacific. M.
We Skyped our friend Mike on “Wombat of Sydney” located in northern New South Wales and he said the wind was “blowing the dogs off of the chains.” The good news is that this weather should start to clear sometime tomorrow and we are looking for a Tuesday morning departure a few days ahead of the next low pressure system. “Wombat” will be heading north around that time as well, so we will have an SSB radio net between the two of us. The boat is pretty much set to go. Every system now seems to work and all of our provisions and other stuff are stowed. We will update our departure plans on this site. We arrived back in Australia one week ago and have been busy preparing to go to sea ever since. Thunderstorms around Atlanta caused us to miss our connection to LA, as our Providence to Atlanta flight circled for two hours waiting for the weather to improve. We got booked onto another flight but it left 90 minutes late due to the weather. Consequently, even though our itinerary showed a 4 hour layover in LA, we still missed our flight to Brisbane. Virgin Australia put us on their last flight to Sydney with a connection to Brisbane. The flight was less than one-quarter full so both of us had a row to stretch out on and sleep. Amazingly, our bags made it to Sydney even though they were tagged onto flights we did not take. The flight to Brisbane provided nice views of the eastern Australian coast. We always underestimate how much effort is required to make Sabbatical III seaworthy, and this time has been no different. 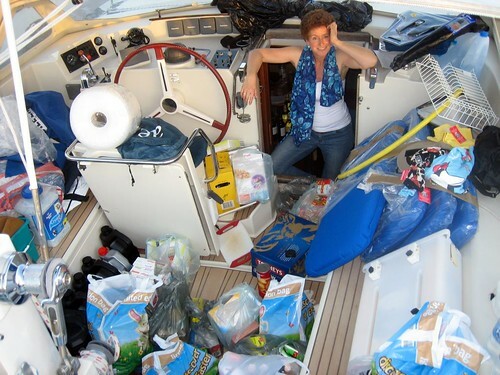 Everything that was “put away” in December has to be put back into place in May — sails, gear, canvas, transducers, etc. In checking out the main sail furling system, I noticed that two of the four bolts that attach the outhaul gearbox to the boom had sheared. The gearbox and motor had to be removed from the boom, and then the remains of the bolts has to be drilled out and new bolt holes tapped. I had professional assistance from Scott of MRE, and used the opportunity to open the gear box and clean and regrease the gears. It took almost two days, but the outhaul is functioning again. We had a nice Toyota Rav4 SUV for the past week, returning it this morning. We had ordered a little Hyundai but got upgraded for free. A good thing too, since we had our friends Tom and Suzie from “Priscilla” with us on almost every shopping expedition. We shopped every day, often more than once. We bought enough dry goods to keep us supplied for five months, plus wine and beer, Coke Zero, frozen meat, and all of the other necessities of life aboard. We always returned to the marina with the car stuffed with stuff. In addition to Tom and Suzie from Priscilla, who we first met at a marina bar in Panama, we have been reunited with Kip and Denise of Adelia, who we first met in French Polynesia. We still have about 2 to 3 more days of work before Sabbatical III is ready to go. However, it is likely that we will be here for at least one week more. Although the local weather has been great ever since we arrived, it has not been good out at sea and it looks like we will get a strong low pressure system bringing 35 knots of easterly winds, large seas, and rain starting early in the coming week. The weather looks unsettled even out more than one week. But forecasts that far in advance are often wrong and we will be checking the weather daily looking for a window to head north to the tropics.